This is my blog that will follow my projects through electronics and programming. I really like the Arduino IDE. I also like the language that is much simpler, if less powerful, than the common Assembly/C code for other AVR's. However, Arduino uses a very limited chipset. You can use ATMega168, ATMega328, ATMega1260, ATMega 2560, and thats about it. Many times I want a lower cost, smaller form-factor chip for a project. The ATMega chips have lots of memory, interrupts, timers, and suchlike, but sometimes that's overkill. That's why I like to use the ATTiny line. A flock of three ATTiny85's and an ATTiny 2313 with a lone ATMega328 outside. but my camera couldn't pick it up. I tried to edit it for better viewing. You have already realized that you can't use the ATTiny chips in Arduino. This is because it doesn't have the cores for the chips. A core in this context is a bunch of code and text that tells Arduino which pins are which, how fast the clock can go, how to upload the program, which functions the chip knows... basically it's an in-depth profile of the chip. I'm going to go over the installation of two cores. The first one is for the ATTiny85. It is the eight-pin chip in the picture. So first, download this core file: attiny45_85.zip (I got it here. Thanks MIT!) You can unzip it with you favorite unzipping program and look around in it if you want. Now you have to find your Arduino sketchbook folder. You can do this by opening Arduino (I'm assuming you have it) and opening preferences. On a Mac, this can be done by Cmd-Comma. Right at the top should be the words "Sketchbook Location." a while ago. You can change the location with the "Browse" button. 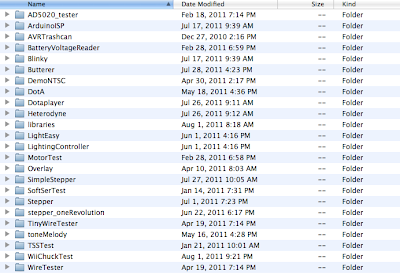 Now, navigate to that folder. Look inside of it for a hardware folder. If you can't get to you sketchbook folder, you can change its location to an easier area with the Browse button. Now quit Arduino. Hmmm... no hardware folder. Time to make a folder! I think Windows has a hardware folder built in somewhere, but I'm not sure whether the process is the same. My old laptop broke a while ago :'-(. Now, drag the unzipped attiny45_85 folder in to the hardware folder. 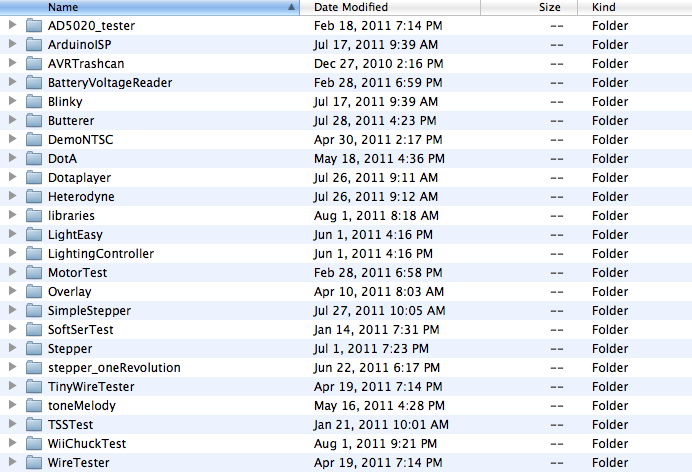 You should have the same folder tree. Oooooh, all sorts of fun stuff. Reopen Arduino and look in the boards menu. There should be six new boards on there! Three ATTiny45 and three ATTiny85 options. Each has a different programmer. I use "ATtiny85 (w/ Arduino as ISP)" the most, but only because I only have ATTiny85 chips and I haven't bought a dedicated programmer. - Navigate to the /hardware/attiny45_85/cores/attiny45_85/ folder. I hope this worked as well for you as it did for me. I will be making post for programming this chip, how to install a ATTiny2313 core, and showing some projects I've used them in. Is the process of uploading the arduino bootloader the same as it would be for an ATmega168 / 328? Nope. No bootloader is needed, actually. A bootloader changes how the chip recieves a program, like the Arduino bootloader receives the program over serial. Since this is recieving it over SPI, no bootloader is needed. you wrote that you will make a post about programming the 2312. can you tell me where you got the core files for it? There are certainly others out there, but this one worked great for me. I got the files from Luminet that you mentioned, but still nothing seems to work for the 2313. I got everything up and running quite well for ATtiny85 & co. 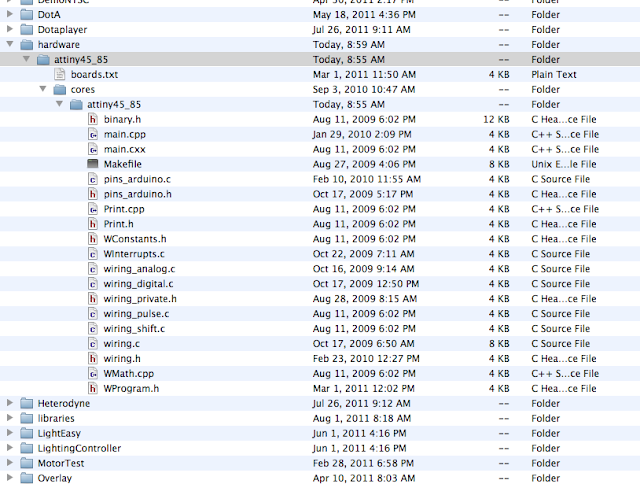 I noticed that the file structure from Luminet is not quite the same as others, i.e. 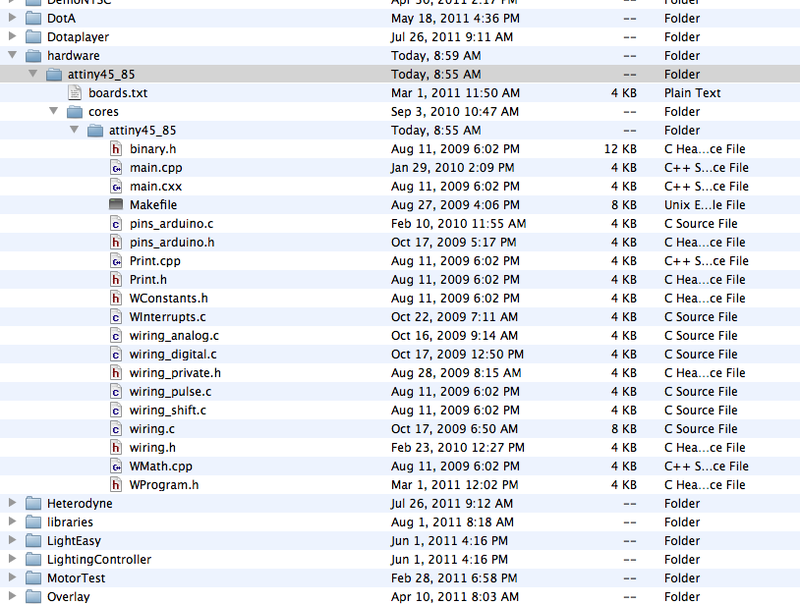 no board.txt file and everything else in a "core" folder. do I need to create these? Sorry for not getting back to you quickly! So this would, in theory, allow use of the full arduino syntax (external libraries, etc), rather than just the 10-12 default commands? I'm pretty addicted to things like my OneWire and LiquidCrystal_I2C libraries, but also interested in embedding things into smaller chips for installation. how can add atmega32 or atmega64 to core supported ide? It gets a compiled CORE.A file from Arduino before it is deleted. He relates how to get the file, copying the location from Arduino IDE build output. I gained allot from the tutorial, setting it up in Studio 6, using Arduino MEGA2560 and 1.52 latest core build. Please let me know if you can get the CORE.a file built by Arduino? I came to look for update to this post, possible updated core files. It is not clear whether to build a core using ALL the core files changing only the ones in the ZIP, or to use only the ones in the ZIP. Am thrilled at new functionality in Studio, and want to get the Attiny CORE working too!